How do senior individuals in more than 50 corporate finance organisations view the immediate future? Can you have it all when you work in Financial Services? Jennifer Sanderson CA, Senior Manager at Lloyds, shares her tips for solving the work-life conundrum. Ian Cornwall of PIMFA summarises the challenges and offers advice ahead of 3 January 2018. What are the challenges for wealth managers in 2018? A group of experts discuss their views. 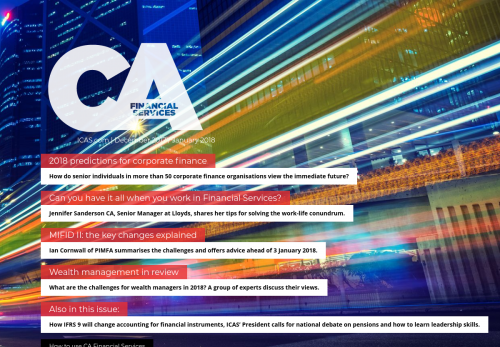 How IFRS 9 will change accounting for financial instruments, ICAS’ President calls for national debate on pensions and how to learn leadership skills.